CipherLab CP55 Windows Embedded Handheld version is Now Ready and Set for Your Deployment - CipherLab Co., Ltd.
Taipei, Taiwan - November 26, 2014 -CipherLab, a leading innovator in Automated Identification and Data Capture (AIDC) presents the new CP55 series mobile computer with Windows® Embedded Handheld 6.5.3 today. The CP55 series Windows® Embedded Handheld mobile computer is constructed to provide a complete setting of 3G connectivity to perform at a high level. Developing application is also simple when standard API is present with the updated operating system option. With the alternative OS readied, the CP55 handheld computer has two different operating systems in Windows® Embedded Compact 7.0 and Windows® Embedded Handheld 6.5.3 but also two display options in VGA and QVGA. It offers users various combinations for demands of compatible system configurations and transfer the existing applications to CP55 series effortlessly. "We are really thrilled about the CP55 Window Embedded Handheld mobile computer's values and benefits," Steven Liau, chairman of CipherLab stated, "The CP55 series can include high performance 3G connectivity with the updated operating system options to provide maximum efficiency for mobile workers." The CP55's flexible wireless communication options includes 3.75G HSUPA with GPS/AGPS allowing location base application, 802.11 a/b/g/n providing reliable data transfer and Bluetooth V2.1 + EDR connecting mobile devices instantly. 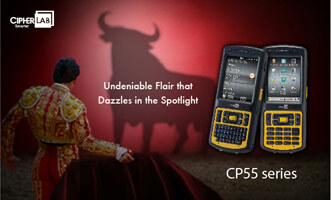 Its high capacity of data and program memory gives CP55 a real advantage in storing data and running programs. It is truly a perfect blend between performance and practicality for your business to enjoy. For more details and specifications regarding CipherLab CP55 mobile computer or other CipherLab products, please visit www.cipherlab.com.